After having taken the Foundations Module, the remaining modules may be taken in any order over the course of three years to be eligible for a 200-hour or 300-hour certification approved by Yoga Alliance. We do recommend that students complete the Mindfulness Meditation Module prior to attending The Retreat. Modules take place throughout the United States and Europe. Click here to view the current schedule. I’m interested in this program. How do I enroll? Do I need to be a teacher to attend? Can I just take this to develop my personal practice? I would like to take some of these Modules, but don’t have any interest in working towards a 200hr or 300hr certification. May I still participate? Do I need to go through the application process? I want to take one of your modules, but am not currently enrolled in the 200hr or 300hr certification track. Will I receive credit for this module if I enroll for the certification track afterwards? What’s the online course and how does it work? What is the 200hr Yin Yoga Teacher Training certification process? I have a 200hr certification in vinyasa yoga but am relatively new to Yin Yoga. Am I eligible for the 300hr program? What is the 300hr Advanced Yin Yoga certification process? What is the difference between the 200hr and 300hr certification tracks? I have a 200hr Yoga Alliance certification from another school, but I want to work towards my 500hr certification. Can I accomplish that with your 300hr track? I see that one has three years to complete this training, however, I am interested in doing this as quickly as possible. Can this be completed in one years’ time? I’ve applied and have been accepted into the program. How do I start taking modules? Is there a specific order in which they need to be taken? May I receive credit for modules I’ve taken in the past? Further Questions? Email Josh using the contact form below. Thank your for your interest! You may apply for the program. There is a one-time, non-refundable application fee of $50. Click here to apply. You may scan it or take photos – and email to: josh at joshsummers dot net. You do not need to be a teacher or even want to teach to participate in this program. We welcome anyone who has a strong desire to learn and a willingness to commit to the study and practice of Yin Yoga and meditation. Yes. All modules, with the exception of the Practicum, are open to anyone with a strong interest in learning more about the content of that particular module. There is no required application to take individual modules. You only need to apply if you intend to earn a 200hr or 300hr level certification. Do I need to be registered in the school to attend a training module? Yes. Here’s how this works: After taking one of the core modules, you will have two months to apply for enrollment with the school, whereupon that module will be credited towards the certification track of your choice. As this is an open-enrollment a la carte-style training, the cost will depend on which track you commit to and the modules you choose to take. For 2018, the pricing for a four-day 50hr core module is approximately $790/euro, and The Retreat can be estimated to be around $1,000/euro. Additional costs may include online coursework for each module (except Practicum and The Retreat), as well as required reading texts. Based on current pricing, one can estimate a 200hr certification would cost approximately $3000/euro, and a 300hr certification would cost approximately $4500/euro. Bear in mind these prices are estimates based on current pricing, and are subject to change in the course of the three years you have to complete the program. Our hope is that the flexibility and time frame of this training will make it an affordable and enriching investment. 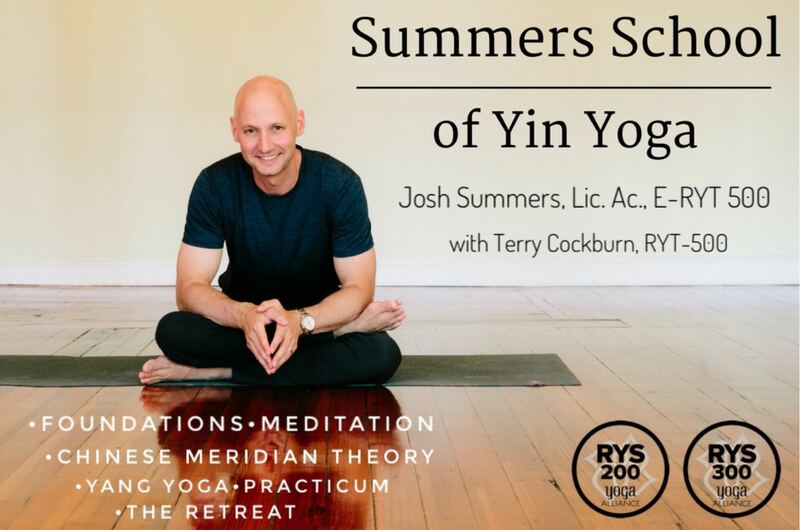 The structure of the core modules (Foundations, Mindfulness, TCM, and Yang) in the Summers School of Yin Yoga is such that there are online introductory courses that all students are required to take prior to live attendance. These online courses comprise 5-7 hours for each module of the training, and cover essential introductory material necessary to understand the live module content. They can be taken online through www.yinyogaschool.com (the first online course will be available starting in October 2017, the others will be published throughout 2018. Please see the online course portal for availability dates). The online courses are a unique feature of the Summers School of Yin Yoga. Each online course will prepare you to arrive at the live training with a solid foundation of the theory and practice covered in each module, allowing us to start at a higher level in our time together in the intensive. You will receive an exclusive access code to the online course via email after signing up (please allow up to a week for processing). You will need to complete the online course, including a short quiz, before attending the live teacher training module. Why is there an online component to the training module? All modules have an online coursework and self-study project. You will have three years to complete all requirements from the time you enroll. Yes. Absolutely. 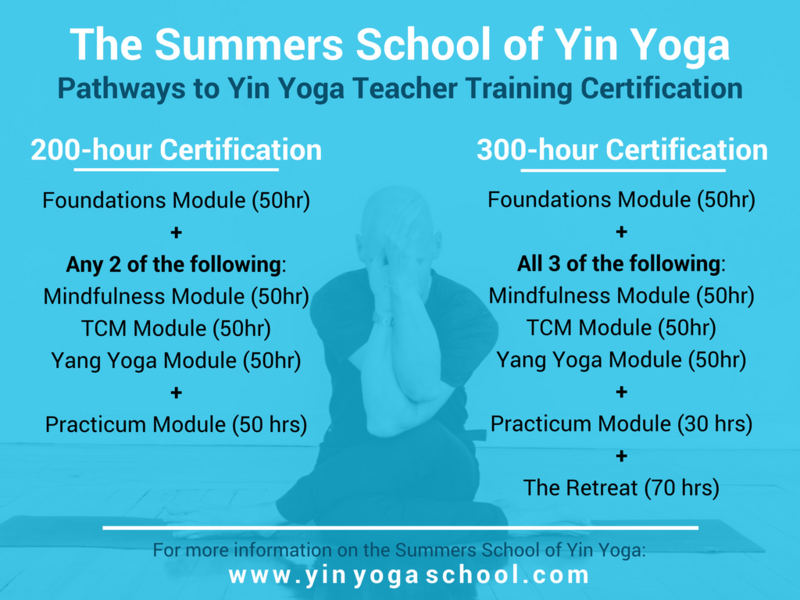 If you have already completed 200 hours of study through a school recognized by Yoga Alliance, you are eligible for the Summers School of Yin Yoga 300hr certification. You do not need to have taken a prior Yin Yoga training, or to have gone through our own 200hr program first. All modules have online coursework and self-study projects. You will have three years to complete all requirements from the time you enroll. Yes. If you currently have a 200hr level certification through Yoga Alliance, our 300hr level program will then give you 500 hours of required training, fulfilling your eligibility for RYT-500 status through Yoga Alliance. That said, there are some non-training requirements that you must complete through Yoga Alliance to receive that designation. Please review those requirements HERE. But the simple answer is, YES. We admire your enthusiasm! Completion of the program within 12 months is unlikely, as all modules will not always be offered in a single calendar year. Finishing in 18 months will depend on where you live and/or your willingness to travel. Please check the schedule here to see what is offered (and when) for the upcoming year. Congratulations! We are thrilled you have made this commitment in furthering your education and deepening your practice. Click here to view the current schedule of modules being offered throughout the United States and Europe. It’s advised to register early to receive the early bird rate and to secure your spot, as many trainings sell out and are waitlisted. The Foundations Module is the first to be taken in either the 200hr or 300hr track. It is also recommended to take the Mindfulness Module before embarking on The Retreat. Thereafter, you may take any modules in any order. For students who have previously taken the Foundations and/or Mindfulness Modules, the opportunity for earned credit has expired.